This is one of those famous books that somehow one never gets to read. Well, seeing it on the shelf recently prompted me to actually see what the man himself had to say. The content, of course, is familiar to all. The theory of natural selection, evolution and the rise in complexity and diversity in the natural world are staples of science and covered in so many more recent books including those by Richard Dawkins. I was therefore not really expecting to be grabbed by this, the original – and I suppose expected it to perhaps be a bit turgid. How wrong I was. This is an astonishing book. Not only does the lucidity and thoroughness of the arguments leap off the page, the style is very literary and engaging. This is a fun book to read, and simply breathtaking in its clarity. No wonder it caused such a sensation at its publication in 1859; to read it now is impressive but at a time when evolution was a near unknown concept the impact must have been cataclysmic. I came away from this book with a new-found respect for Charles Darwin. The quality of thinking, the intellectual rigour and the attention to detail is exemplary. Darwin supports even minor points of his thesis almost with asides about how he grew and examined thousands of plant seedlings, or bred racing pigeons – such commitment to ensuring every aspect of the theory is supported by observed fact! He is also merciless in critiquing his own work; examining arguments and phenomena which might cast doubt on evolutionary theory, and in most cases showing why those arguments can be overcome – but also having the honesty to admit in some cases those arguments may be difficult to counter. Darwin is sometimes depicted as some kind of gentleman scholar; a slightly bumbling amateur. Reading this work immediately dispels this notion. Darwin is a scientist of the highest calibre; a true genius who deserves to be elevated to the pantheon of greats alongside Einstein and Copernicus. The other thing that reading ‘Origin of Species’ made me realise is why Creationists insist on depicting those who would rather base their world-view on facts than mythology as ‘Darwinists’. 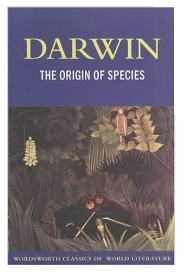 In the course of this book, Darwin elegantly refutes pretty much every argument ever made by Creationists, even those still being made today. In essence, Creationists have never got past Darwin; they are unable even today to refute the observations and conclusions he drew in 1859, let alone the huge weight of additional evidence that has been uncovered in the intervening 150 years.